Top 10 Reader Favorites for 2017 – What an Amazing Year! Although I’m often surprised by the top reader favorites for the year. Most of these are some of my personal favorite home decor posts, too. The old adage, “time flies when you’re having fun” is so true. 2017 went by in a blink! It was a much better year in so many ways! In spite of a few major disappointments, we have been rejoicing in God’s goodness and provision throughout the year and feel so very blessed. The end of the year is a good time to look back and see just how blessed we are. I pour my heart and life into this blog so it’s fun to discover the posts you liked best over the year. Your top picks included a few of my favorites, too. Here are your favorites beginning with Number One. #1 – Don’t you just love happy accidents? Not the kind where you back into someone and there’s no damage to either of your cars. No, the kind where you do something with one purpose in mind and come out discovering a new use for that item. That’s what happened with this accidental life hack. 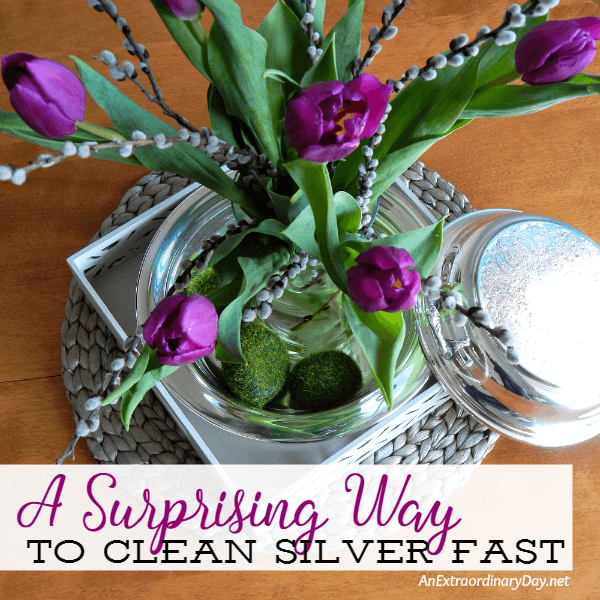 It was such a happy accident to find another product to clean the tarnish from my thrifted silver pieces. I’ve since discovered that it doesn’t work every time. Which leads me to think that not all “silver” pieces are created equally. Regardless, it’s always great to have another tool in our housekeeping arsenal, isn’t it? 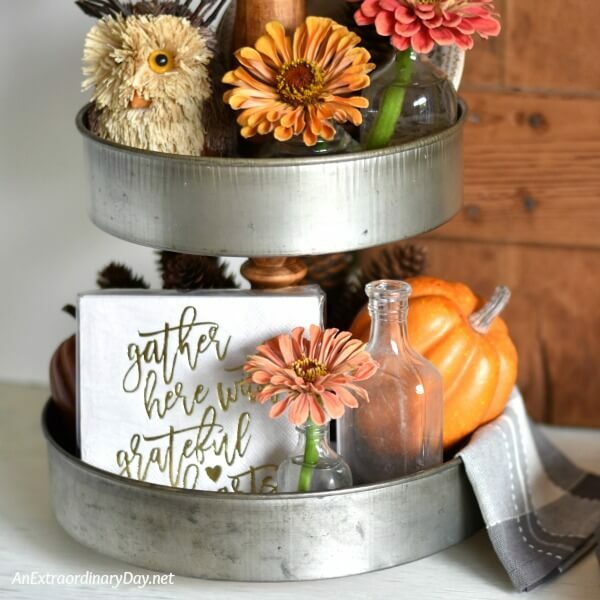 #2 – Ever since they started making their appearance, I’ve love farmhouse style tiered trays. Usually, a little expensive for my budget, I had high hopes for making one… someday. Over time I gathered all the pieces to create this beauty. Many tiered trays are large, suitable for deep counters or buffets. I have very little horizontal surface area, so being able to create one that is smaller in size was a double win and the bonus was that it was easy, too. #3 – Every spring those lilliputian February Gold daffodils make their appearance in the grocery stores. I wanted to find a way to use them to make a super cute Easter table centerpiece and had so much fun putting this whole table together. I guess you love daffodils as much as I do. #4 – This summer I decided to do something that I’ve always wanted to do… make a water feature. If you’ve never created a water fountain… I highly recommend it. There’s nothing like listening to the water trickling. It’s so soothing to the soul. I made a Simple Water Fountain for my Balcony Garden and Love it! #5 – Living in this tiny apartment, there isn’t room for a coffee table and a footstool. Since I like to put my feet up when I write, the footstool was the higher priority for me. But, then, there’s the issue of where to put my cup of tea. This was such a fun and easy project which not only gave me a coffee table ON my footstool, I love the charm it added to our living room. #6 – One thing I’ve discovered while living in this small space is that I need to look at decorating it differently than I would have with one of my houses. Although furniture needs to be a scale in keeping with the room size the decor shouldn’t be diminutive too. I’m smitten with the wall art I created. Since then, I’ve made a few changes to the living room when I added a gorgeous Christmas tree and decorations from Balsam Hill. The same rules still apply, but I’m loving my space even more, now. #7 – It all started with an ornament I created for our 31 Days of Handmade Christmas Ornaments blog hop. Once the tree was decorated, the tree then inspired a complete makeover of my bedroom which was perfect for Christmas and with a couple of change-ups will be cozy for the whole winter. #8 – What is there about pansies and johnny-jump-ups that delight the eye and soul? I was elated to find those smiling faces and transform my Easter vignette to a spring vignette so easily. It was a great little project that came about after I gave myself a little bit of necessary grace. Maybe you hold yourself to an unreasonably high standard sometimes, too? #9 – To be honest, I don’t like living in an apartment. More than anything I want to be able to walk out my door and putter in a garden. However, I am where I am right now, so I decided that I needed to make the most of it by creating a beautiful garden space on my long skinny balcony. it was one of the best decisions ever. It was a relaxing oasis for me and I so enjoyed experimenting with some new plants for my containers with stunning results. Over the past three years, I’ve been hosting this wonderful tour of handmade Christmas ornaments for the entire month of October. It’s incredibly fun doing this with my blogging community. There are so many creative ideas each day of the event. This was my entry and it’s one of my favorite handmade ornament designs of all time. I love using elements from nature in home decor and these are totally natural from the gathered birch slices to the collected pine cones. And they are so EASY too! You can make these, too! Thank you for making this such a special year. I love reading your comments and interacting with you on Facebook, too. And, I love hearing about your life and how you’ve been inspired or challenged by my posts. Thank you so much for taking time to encourage me. You have no idea how much your words have meant to me. You are the BEST! Because you’re such a good friend, when you revisit some of your favorite posts here, would you take a minute to use the sharing buttons to let your friends know your favorites and pin them on Pinterest, too, please? That would totally make my day. PLUS… you’ll help more people know about all the fun we have here together. It’s been a wonderful 2017! But… I’m already planning for an extraordinary 2018. Because I believe in the power of prayer… would you pray for me and An Extraordinary Day this year? Please pray that I would hear God and follow his direction so I can provide you with an even more wonderful year of posts filled with hope, joy, and lots of DIY inspiration. Thanks! That means so much to me. For more inspiration, join me and some of my blogging friends over at Southern Hospitality where we are linking our year end wrap-up posts. I always love a good blast from the past. If you do too… check out these posts! Top 10 Posts for 2014 ~ Reader Favorites! Diane, I can’t believe I missed your fountain earlier this year! You know I love those water features and the SmartPond products are my favorite. Fun to see your past posts, since I’m a newb to your blog! Thanks for sharing. Have a blessed New Year! I’m so blessed to have you here, Julie! Thank you!! Hope you have a truly extraordinary New Year! !